Hashes are popping up on brunch menus everywhere. They are a great way to showcase the vegetables of the moment before noon. Breakfast is the most difficult meal to load with veggies. Vegetables juices pack a lot of vitamins and nutrients, but they lack fiber and frankly, they aren’t very satisfying. Prior to this hash, my best vehicles for getting veg into breakfast were a veggie BLT or an omelette or quiche. Hash allows the vegetables to be the star of breakfast. The eggs take the backseat in this dish, the runny egg yolk as a light sauce and the white as a light binder. 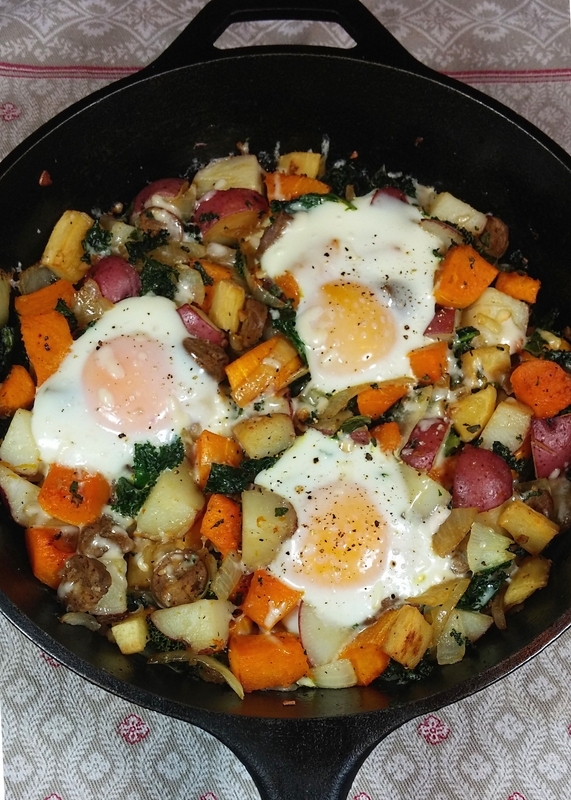 This hash uses late winter vegetables: squash, parsnips, kale, potatoes. The vegetables are cooked until tender and seasoned with winter herbs. You can easily omit the dairy if you like. To make this vegan, omit the cheese and egg, then double the veggie sausage and add 2/3 cup of tofu. You can skip the oven step with the vegan version, just toss the mixture to combine and heat the tofu through. A delicious dish for a cozy winter brunch. This dish serves 2 generously and 3 moderately. Toss squash, parsnips and potatoes with olive oil, salt, pepper and thyme leaves. Arrange vegetables on a parchment-lined baking sheet, making sure that the pieces are evenly distributed and not touching (this will help them brown better). Allow squash to cook for ~20 minutes, then check for doneness. Vegetables should be tender and easily pierced with a knife. Heat margarine in a cast iron or other oven-proof pan on medium heat. Add onions and garlic and sautee for 4 minutes or until onions are just beginning to soften. Add kale and sautee for 3 more minutes. Add squash mixture, veggie sausage and sage and cook for another 2 minutes. Remove pan from heat, check for seasoning and add more salt and pepper if needed. Top mixture with cheese (if using). One by one, crack eggs into a small bowl and gently pour on top of hash. Season eggs with salt and pepper and return pan to oven and cook for 5-7 minutes until eggs reach your desired level of doneness. * If you are using a larger squash, you can reserve the rest of the squash for another use. I like to dice up and roast the entire squash, then save the remaining squash to toss into salads.